Last heard from around Christmas 1913, Ambrose Bierce probably died sometime in 1914, somewhere in Mexico. His disappearance has spawned many theories, ranging from death by a firing squad under Pancho Villa’s orders, to, perhaps acting under the influence of his motto, “Nothing Matters,” a suicide. One of the wildest explanations for Bierce’s vanishing occurs during a segment of Ancient Aliens, which I’ll touch upon in a bit. We do know, for sure, that Bierce was one of Robert E. Howard’s favorite writers—the Texan, in a letter to H. P. Lovecraft states it. For further affirmation we need only look to Don Herron’s The Dark Barbarian where Steve Eng, in his list of Howard’s library, notes that judging from a sheet found among REH’s papers he paid 49 cents for Bierce’s Fantastic Fables, and Eng adds that the pulp writer’s shelves, at one time, contained a copy of Adolphe de Castro’s Portrait of Ambrose Bierce. Called “Bitter Bierce” for a variety of reasons, this writer displays a softer side in a recent addition I picked up for my autograph collection. 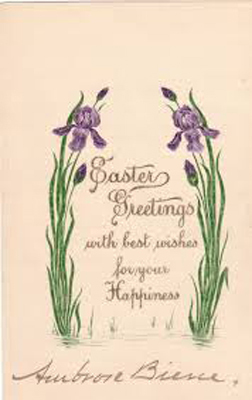 Agnostic or atheist, Bierce took the time out, in a card from 1912, to wish an acquaintance “Easter Greetings.” He was apparently one of those fine people who are able to honor a religious holiday, not because he believes in it but because a friend does. Perhaps Bierce wasn’t such a misanthrope after all. I’m fairly certain that many of Howard’s fans watch Ancient Aliens, a production of the History Channel 2. The photography is stunning, and the information about vanished civilizations can be enlightening, and entertaining. However, some of the theories advocated by the ‘talking heads’ on the series can be pretty lame-brained. While I haven’t seen every episode, it would seem that aliens have pretty much done everything in the history of our planet, making all the great accomplishments of Mankind merely the result of helpful extraterrestrials. I can’t believe that, and neither can I swallow the supposition that I’ve heard came up in one program—namely that Ambrose Bierce’s disappearance happened because he was able to contact aliens who guided him into another dimension. Bierce, much like Williamson in “The Difficulty of Crossing a Field” was there one minute, gone the next. So, if these aliens really can do everything, perhaps they’ve kept Bierce alive, and he’s working on some damned thing in an aircraft hovering hundreds of miles above Earth. I wonder, can such things be?